Following the success of the One Republic concert at Abbey Road Studios last year, Hilton Honors has arranged another exclusive London gig for its members. 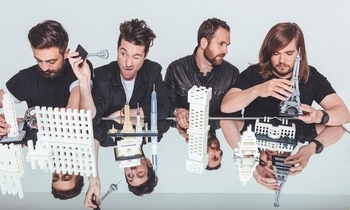 Bastille will be playing at LSO St Luke’s on Old Street on Saturday 9th June at 7pm. The initial reduced price pre-sale tickets sold out quickly after we wrote about them. A far larger allocation of tickets is now available at a slightly higher cost. There are enough pairs available that I would feel confident in transferring Amex Membership Rewards points across (48 hours?) to secure them. The conversion rate into Hilton Honors is 1:2. Packages include two tickets and a food and drink reception beforehand. This package gets you two tickets for 60,000 Hilton Honors points. If you need somewhere to stay, this package gets you two tickets plus a night at the DoubleTree Islington hotel for 115,000 points. One Republic was an excellent night – the global head of Hilton Honors had even flown over for the event. This one will hopefully be as good, and we will try to get along. Hilton has launched a special promotion for anyone planning a trip to the US West Coast. 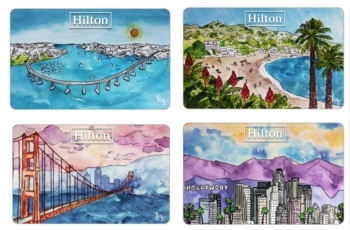 Guests who book the California Road Trip package at participating Hilton hotels in California will receive one of four collectable key cards which will unlock experiences in the area. In San Francisco, for example, the key card will give you free Bi-Rite ice-cream, a free drink at DOUGHP SF and discounts at the Anchor Steam Brewery. In San Diego guests will get discounts at over 20 museums and a complimentary harbour cruise. In addition guests will get free breakfast or premium wifi. I don’t normally mention brand switches but long-term readers know that Sheffield hotels pop up on here from time to time! Two weeks ago I had what was arguably the worst hotel meal of my entire life in the Holiday Inn Sheffield, not helped by having to wait an hour from ordering in order to receive said worst meal. At the time I thought that the hotel was sliding deeper into disrepair with every annual visit we make. I was therefore shocked to find that Holiday Inn Sheffield is being rebranded as a Crowne Plaza later in the Summer! There is some refurbishment work underway, I admit, but we are talking about a hotel which gives no elite recognition as far as I can tell and which generally gives you a worse room – rather than a better room – than the one you booked, the other weekend being a case in point. The new bathroom in our old room had clearly been tiled by some random con-artist picked from Yell. And the pancake machine has disappeared! The upside of staying there is that you don’t need to bother bringing an alarm clock. There are so many moth holes in the curtains that the rooms is flooded with light as soon as the sun comes up …. Stayed in the HI Sheffield 4 years ago, had a room looking over the front car park. Lovely building, but very dated. Clean enough then. I do like staying in these old Station hotels. Also stayed a few times in the Hilton in Nottingham. A good refurbishment would make them really good places to stay. I only go to Nottingham for the ice hockey, and any time I’ve been there, it’s been a nice place, certainly been to worse city centres! I’m currently in the doubletree in Nottingham and it’s very nice (no pool though). It’s not far from the centre of Nottingham and well worth the points cost. I quite like Nottingham. Not as trendy as say Manchester but a I personally rate much higher than the likes of Birmingham. An interesting HI experience last night, though I have promised not to name the establishment in question, but it would not be regarded as a typical bank Holiday destination, nor was it Sheffield. We did need to be in the area though. And it should cover three of my Accelerate targets and contribute to three more. I also had to rebook it on Thurs as the price had dropped. Anyway, check-in, asked if I wanted points or a drinks voucher – I replied, as always, drink vouchers please (note the plural). I got just one drink voucher, and so I trotted out my usual line (quite true) that I usually (not always) get two vouchers. No luck this time, receptionist appeared to be a jobsworth who just quoted the IHG rulebook at me. But as he handed me the voucher and roomkey, he said “I have already added you points”!! Got up to the room, barely sat down when the phone rang, receptionist telling me that he had spoken to the duty manager, who had authorised a second drink voucher, but stressed over and over again that a) the hotel was paying, not IHG and b) I was not to tell anyone else. Indeed, when I collected the voucher it was heavily overwritten to the effect that it was to be charged to the hotel, not IHG. I have always assumed that the vouchers were always at the hotel’s expense, not something to be recovered from IHG. Anyone else know more? At check-out it was mentioned that the place is going to be completely refurbished from the very end of this year/early next year. It will certainly benefit from a thorough refurbishment. Staff were all very pleasant, though. I stayed in the holiday inn Sheffield about a year ago and exactly the same happened to me. Waited over an hour for a terrible meal – staff were young and clueless (not their fault they’d not been trained properly, management fault). When they asked me to review the hotel I complained. Their response was that they’d look into it and make sure it doesn’t happen again – clearly they took absolutely no notice. Raffles, why on earth do you put yourself through it if it’s that bad? Definitely a sense of masochism about this. We only stay once a year and my wife really like the old Victorian building – but even she has had enough now. The only Sheffield hotel I’ll use now is the Doubletree, it has a welcome reception for Diamonds as it has no lounge. Rooms in the new extension are excellent. Having just spent the night in the HI Sheffield I must say I was pleasantly surprised, elite status recognised and duly upgraded to an executive room, which was more like a suite (202) meal was ok, no long wait, although on a bank holiday Monday there was few guests. Breakfast was standard HI. The Hotel is a little tired in places, but there was no moth holes in the curtains in my room, which wouldn’t look out of place as a Crown Plaza suite, If all the rooms are going to be updated to this standard I’m sure the next time you book it will once again be your choice of HI in Sheffield. There are two wings, the old wing and the new wing. I have never, ever been given a room in the new wing – probably because I only ever stay at weekends and they keep function guests in the new wing. The pics on the website showing massive spacious rooms are presumably the new(ish) wing as they bear no relation to any room I have ever had there! Got a call from Hilton Honors USA today offering the Bastille tickets for free. No hotel stay though. Last year got the OneRepublic package with one night stay at the Hilton Paddington. They do this for some top Diamonds. Come, should be a good night. Still need to tap up the person running the press list ….